FishEaters Traditional Catholic Forums - St. Mary's in Cashton: "Institute no longer needed"
FishEaters Traditional Catholic Forums > Church > Catholicism > St. Mary's in Cashton: "Institute no longer needed"
Full Version: St. Mary's in Cashton: "Institute no longer needed"
Wow. I hope this isn't bad news for those traddies. It's gonna be a rough ride. According to the Remnant, "Father Klos has been the priest of the Novus Ordo parish (Nativity of the Blessed Virgin, St. Mary's Ridge, WI) which shares the church with the Latin Mass Apostolate for several years. We are told that he does not know how to say the Mass in the Extraordinary Form, and has not participated in any of the Latin Mass Apostolate functions thus far." BTW, the image posted above is from St. Mary's in Cashton's website. 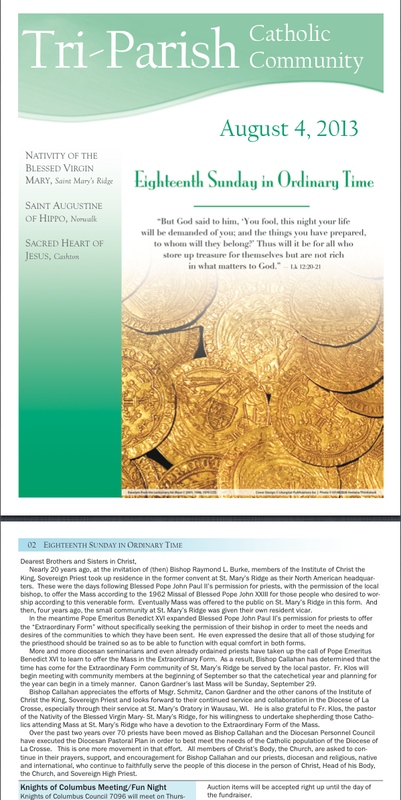 It is currently on there, from the August 4th, 2013 bulletin for the three catholic churches in Cashton. I just took a screenshot of the relevant pages. Horrible news, then. Those poor people. But not to pre-judge. Things might be okay for them! On the whole, I'm not terribly surprised; I knew shortly after Pope Benedict resigned the liberals were going to start rolling back where they could. Of course. Like I said above though, my only fear is that the institute and/or FSSP can be this easily ousted... my understanding was that their status as a pontifical right protected them somewhat after being invited. Of course, we do not know all the details, but it is slightly unnerving. (08-05-2013, 03:44 PM)OzarkCatholic Wrote: [ -> ] Of course. Like I said above though, my only fear is that the institute and/or FSSP can be this easily ousted... my understanding was that their status as a pontifical right protected them somewhat after being invited. Of course, we do not know all the details, but it is slightly unnerving. They are not exempt religious as in a religious order, so Canon Law handles them a bit differently to begin with. In addition, even if they were exempt religious, the Bishop still controls who has faculties in his diocese, and who operates a parish in his diocese. I have a hard time understanding why a Bishop who is probably dealing with a vocations shortage as there is everywhere else, would want to turn away help where it is freely given and things are going smoothly, but it is his prerogative to do so. Exempt religious could not be prevented from providing the sacraments in their own houses, but they could be restricted from offering them to the public should the Bishop decide to do so. I'm rather concerned about it, too, to be honest. Not necessarily in the St. Louis area, which has a fairly large traditionalist footprint (ICRSS, SSPX, SSPV, multiple diocesan locations, etc). Archbishop Carlson doesn't have community activity that Auxiliary Bishop Hermann or Cardinal Burke did, but at least he's made the attempt to remain on good terms with us and give at least tacit support, considering many members of the Oratory have a guiding hand in many of the Archdiocese's most popular Apostolates. I'm significantly more worried about other areas, however. I am not sure this makes such a difference from diocesan issues. By that I mean that all over North America they are closing churches and merging parishes, so this does not surprise me, nor is it necessarily distressing. If the Institute has people that want them to continue, such people can pay what is necessary to keep the community going. In the end, there must be a balance between religious institutes and actual people. This is different from the example of monasteries, which are self-sustaining, and I think trads should be thinking perhaps more in such terms. Trads need to be self-sustaining, not dependent on anything diocesan except the usual permissions. The Institute does a great deal of good and I have no fear for them as a result. Sterility will continue sterile, and fruitfulness will survive and eventually thrive.